Light weight, field to freezer combo with the two perfect blade designs for skinning and deboning big game, and a carbide sharpener to keep a razor’s edge at all times. The 4.5 inch deep bellied gut-hook skinner removes hide quickly and opens game like a zipper without piercing vital organs. The 5.0 inch boning knife is ideal for breaking down any animal into family sized portions. The 420J2 stainless steel blades are precisely heat treated and hand finished shaving-sharp for superior edge retention and performance. Rubberized, blaze-orange TPR handles never get lost and eliminate fatigue during long use. 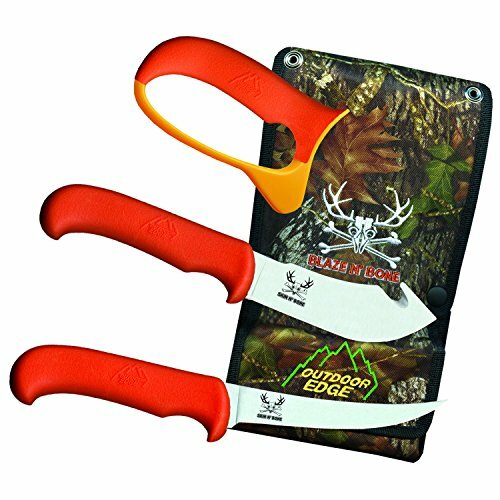 Comes complete with a Mossy Oak sheath with a snap-in knife scabbard for easy removal and cleaning.